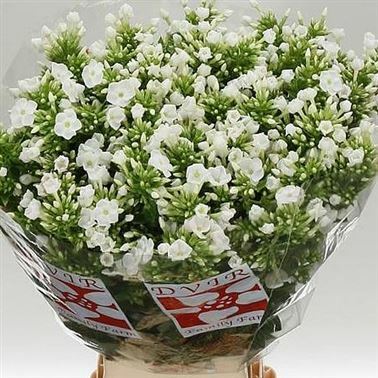 Phlox Icecap 50cm is a beautiful White seasonal cut flower - wholesaled in Batches of 50 stems. Phlox, (pronounced 'Flocks'), is regarded by many as a summer flower, but in reality, is available commercially for most of the year. Some varieties of phlox are available from the start of February to the end of December. Others like Phlox Snowwhite Fantasy is only available in May & June! Phlox is a genus of the Polemoniaceae family. Phlox is available in many varieties on the wholesale flower markets in lilac, white, pink, purple, red and some beautiful two tone varieties and is becoming increasingly popular for use in wedding flowers.